All the while, I have been reviewing data recovery tools for Windows. 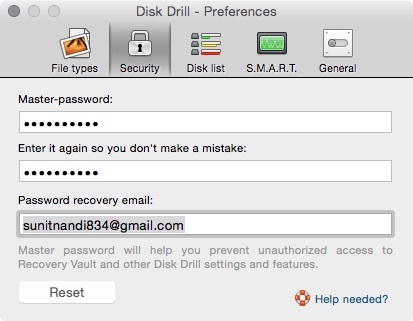 Today, I’ll be trying out a similar tool for our readers who are Mac users, named Disk Drill. Huge thanks goes out to the team at 508 Software for providing us a Pro license key and other help. As previously, I’ll try my best to be as detailed and lucid as possible. I hope that you’ll like my review as much as I loved writing it. 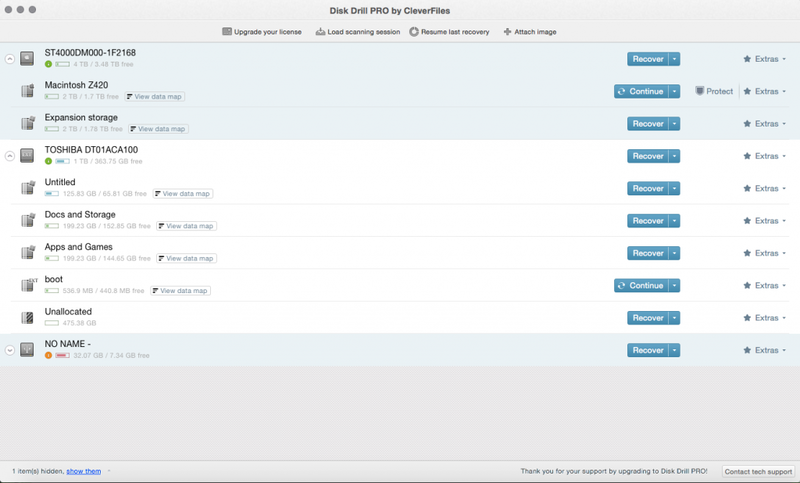 Disk Drill can be downloaded from here. All you need to do is double-click the dmg file to mount it and move the app to your /Applications folder. Once it is installed, you start it from the LaunchPad and are greeted with a screen that asks a few questions. After checkmarking what you require, clicking next asks you for your administrator password to proceed. Once we are past that, the app demonstrates its features with a short tour. After the tour is over, you are asked if you wish to continue with the free version or upgrade to Pro. I had an upgrade key so I entered it in the field given. Finally, we are greeted with the start screen. The start screen lists all the hard drives and removable drives connected to the Mac. Clicking the tab on the left side of each entry displays the partitions present on that drive. 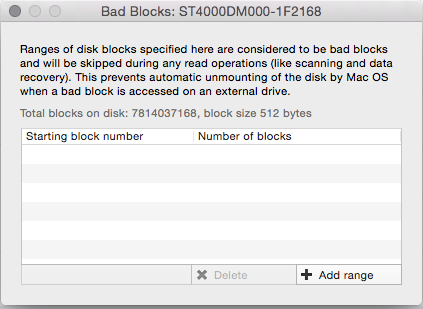 First of all, we’ll start by scanning a drive, the HFS+ drive on which OSX is installed. The scan takes a while depending on the size of the disk. 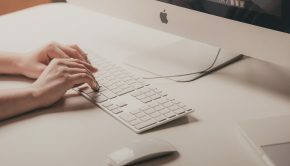 When the disk scan is complete, we see a whole list of files enumerated and reconstructed, the files can be recovered on by one basis or the set of found files can be mounted as a virtual disk. 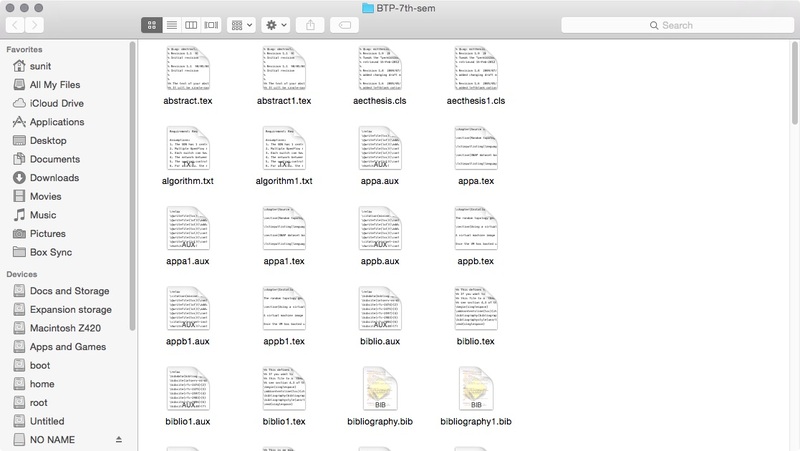 For a random test, I choose a folder. 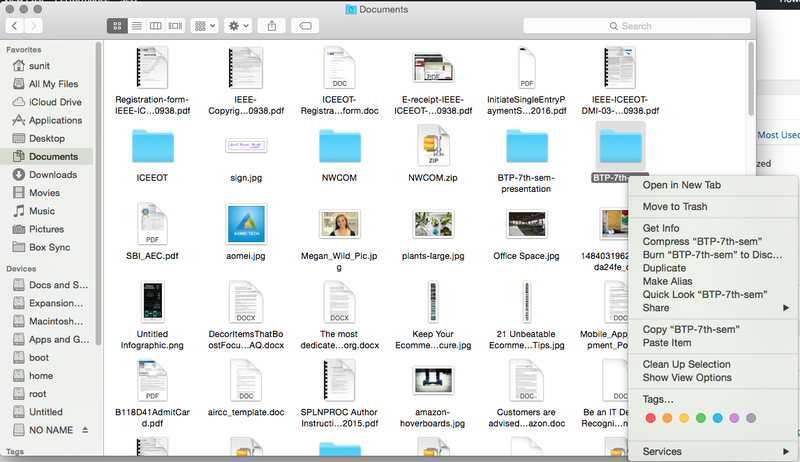 Here are the contents of the folder. Then I delete the folder. I then run a disk scan to locate my deleted folder, and soon afterwards searching the name, the the lost folder is found. I proceed to restore the folder and it asks me to choose a save location. The recovery process completes with no errors reported. The diff command doesn’t return anything which means the checksums of files in both the directories match. 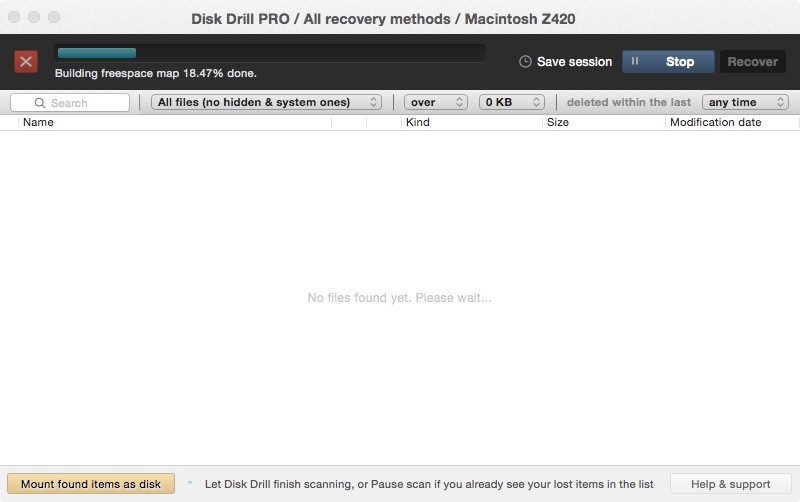 This clearly verifies that Disk Drill has successfully managed to recover the file even after it was deleted. We can therefore, believe that this app works as we’d expect it to. Apart from HFS and HFS+, the other filesystems from which Disk Drill can recover are FAT16, FAT32, exFAT, NTFS, EXT3 and EXT4, making it a more complete solution compared to other data recovery tools in the market. 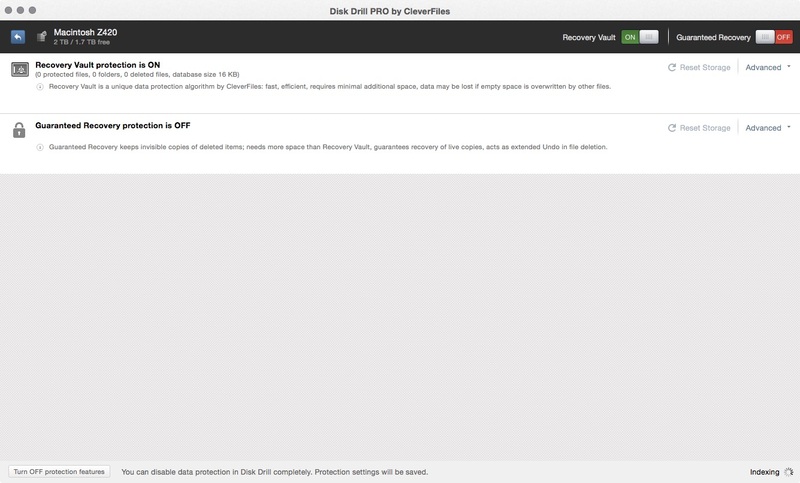 Most recovery utilities for Windows and Macs conveniently ignore Linux filesystems, but this isn’t the case with Disk Drill. 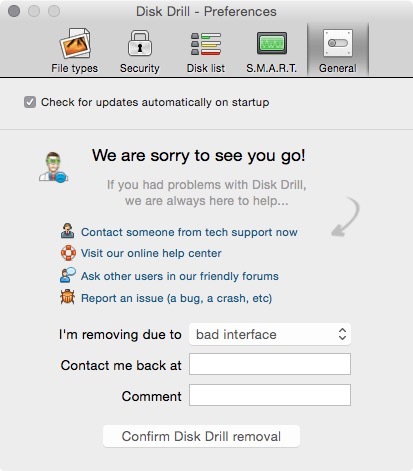 Apart from data recovery, Disk Drill offers a hot backup option for the drive on which OSX is installed. 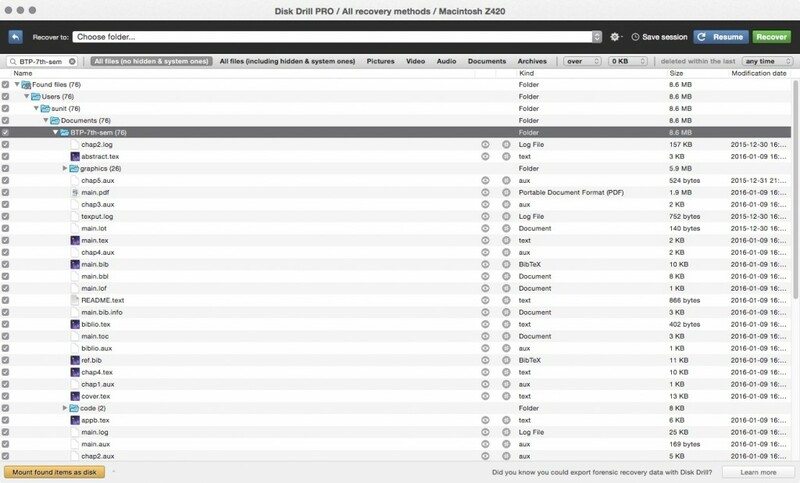 Clicking ‘Protect’ in the OS drive in the main menu gives you two options, namely Recovery Vault and Guaranteed Recovery. 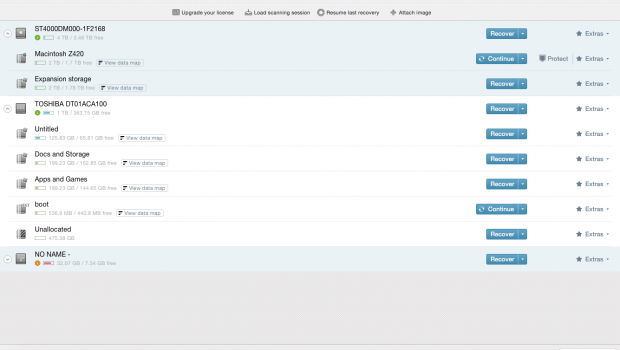 Recovery Vault is a simple file-system snapshot scheme and saves changes to files incrementally to a database so that lost files or changes can be rolled back later. 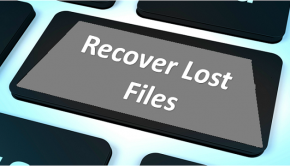 Guaranteed Recovery, on the other hand is a file mirroring scheme that saves copies of files on the disk space to other locations. 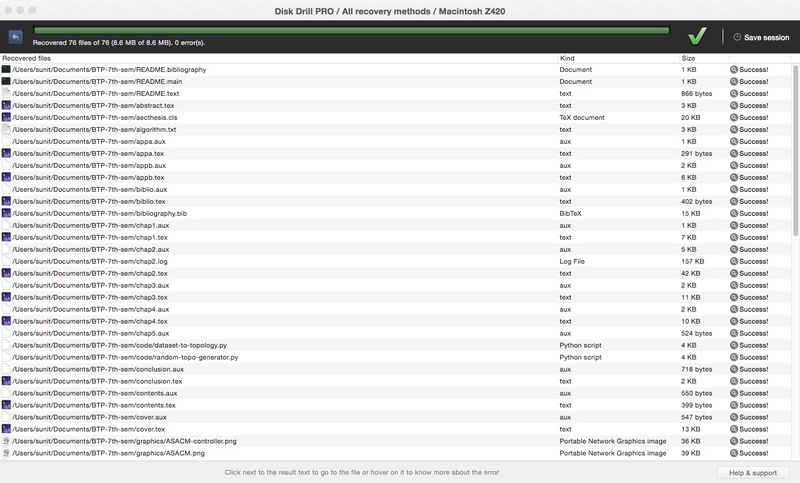 And as you’d expect, Guaranteed Recovery is more reliable but comes at the cost of disk space. 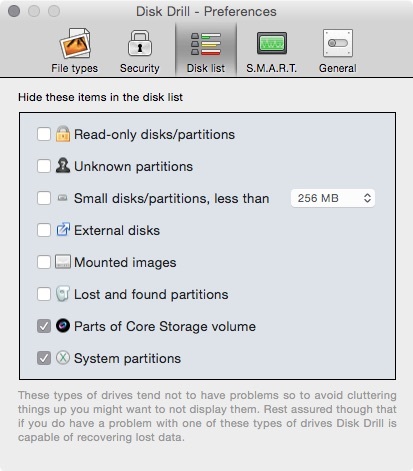 Finally one can use the ‘Extras’ menu to export your drives as dmg images (drive imaging), to get info about the drive and specify bad blocks if it is a storage device. 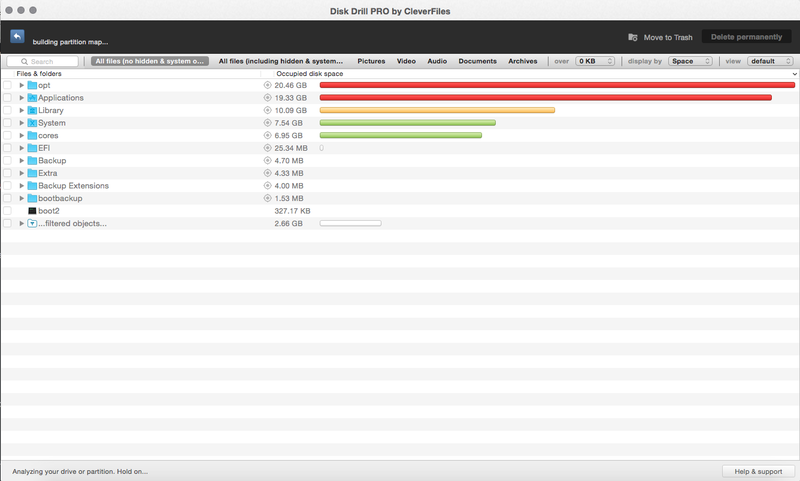 There is even a ‘data map’ feature that lists the disk usage of files in a descending space consumption usage order. 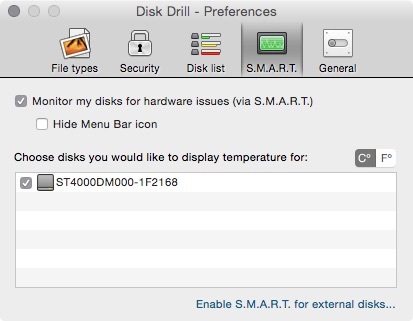 Disk Drill’s Preferences menu, allows you to choose the file types you wish to recover, a secure mechanism to lock access, gives you ability to hide/show partitions according to type, configure S.M.A.R.T. status to be shown on the MenuBar and a general section that toggles the ability of the app to check for updates and also allows complete removal of the app from the system. The interface is well laid out and very straightforward to use. The app seems to be rock solid and pretty mature, as I could not find any sort of minor quirks. I can definitely recommend this to any Mac user who wishes to take care of their files and recover from unforeseen circumstances like accidental deletion, data corruption or drive failure. 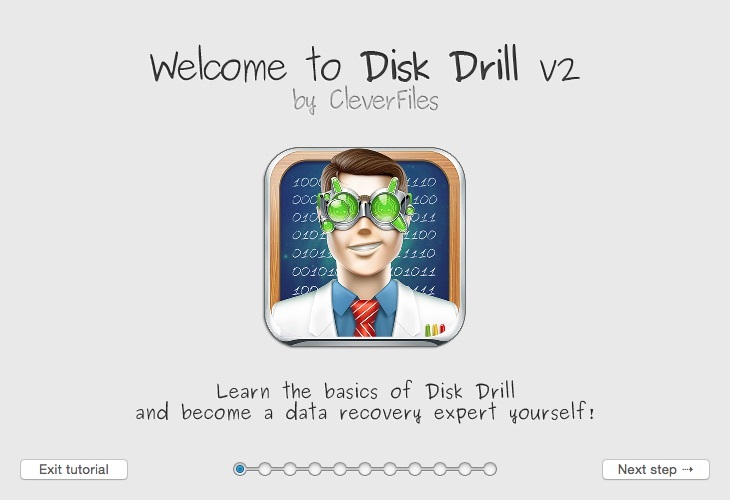 Disk Drill is downloadable from here. 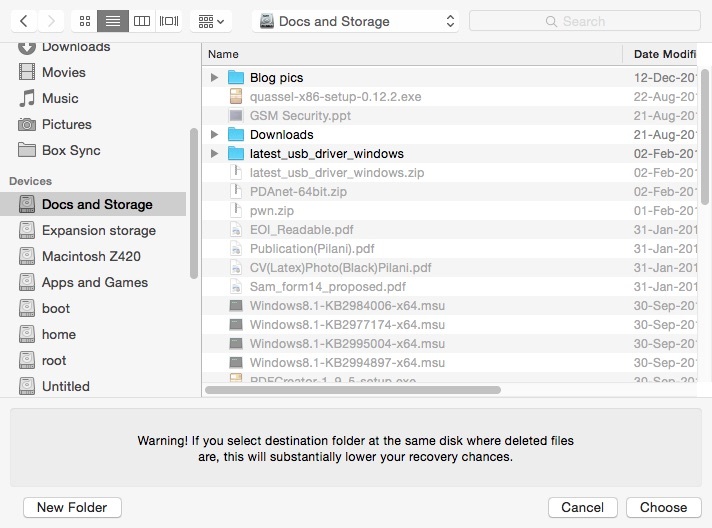 The basic version actively monitors your drive and saves you from accidental file deletion. However, for recovery of lost files (files lost before Disk Drill was installed or files lost when the app is off) requires one to buy the Pro edition for $89 (which includes installation on upto 3 Macs). One can also buy the Enterprise Edition (installation on unlimited no. of Macs) for companies and institutions for $399. 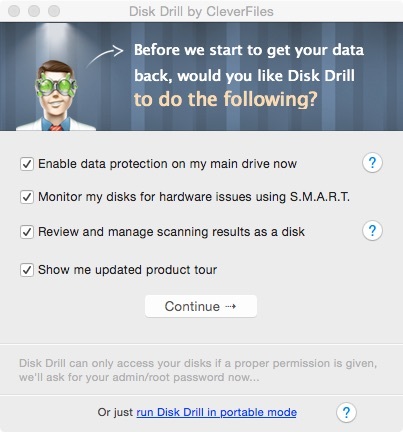 Disk Drill Pro is an effective data recovery tool for Mac OSX users whether novice or expert. 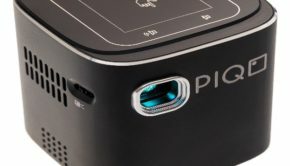 It works perfectly, supports all popular filesystems and provides ample active measures to prevent data loss. We can happily recommend this product to our readers. I have experience of using this user friendly software. I accidentally deleted one 4 GB file from my hard drive. My brother recommended me to use Disk Drill. Though I never use data recovery software before, but I was able to recover easily by this software. This software supports for HFS, HFS+, FAT16, FAT32, NTFS, EXT3 and EXT4 and very useful for lost partition recovery. I found later that the data recovery speed is faster than most of the data recovery software. But video recovery rate should be more faster. 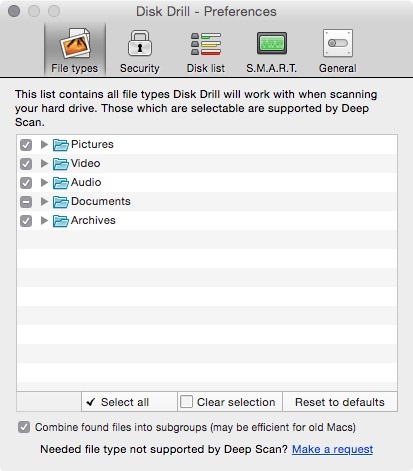 The quick and deep scan function is also very useful to fix normal malware issues. This is a software where you have the full control of recovery system to you.